Although I need to spend more money on gaming-related goods about as much as I need another hole in my head, I can't help but crave the custom, Miyamoto-branded 3DS case below. It was created by the proprietor of the KickassCases etsy shop, by the way, and it can be purchased (here) for just $20. 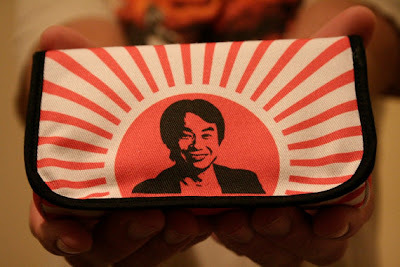 Looking for a custom 3DS case, but not interested in one that features the grinning visage of Shigeru Miyamoto? You still may want to check out the KickassCases shop--especially if you're a Mario, Yoshi or Zelda fan. I'm pretty fond of this Kirby one and this Tetris one myself. SWEET! If I were looking for a case for my 3DS, this would be the one I'd want. It's odd enough to be interesting, and niche enough to make people who are not in the know go, "What is that?" The Kirby one is everything.